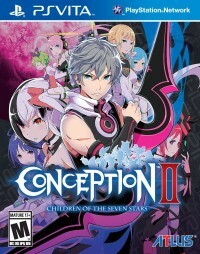 When we first got a hold of Conception II: Children of the Seven Stars, one of the points in the Q&A press release was that the game might be offensive. From all the media circulating around—be it trailers, screenshots, or whatever else—it seemed easy to imagine it was about its sexualization and imagery of females. But after getting into it, it’s a striking blend of controversy and hilarity which makes Conception II an interesting and unique game. In all, Conception II is a borderline mess, but somehow it reaches above its own shell and offers something seriously original and also a whole lot of fun. The comparisons to Persona 4 are not completely well founded, although it bears clear aesthetic resemblance to the title. When it was first announced Atlus was bringing the game to America, people cheered as they wanted to play another high-school role-playing simulator in the same vein as Persona 4. While Persona 4 was something of a friendship simulator and dungeon crawler pushing along a compelling murder mystery, Conception II is definitely different. Classmating is not similar to building social alliances in Persona 4, nor is it particularly about making friends. In fact, it’s quite literally about having children. 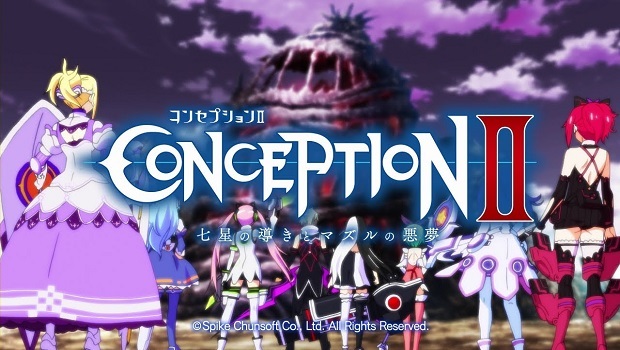 Perhaps it’s sly propaganda to get Japanese youths interested in having children again, Conception II tries to encourage baby-making in a fun and attractive way. 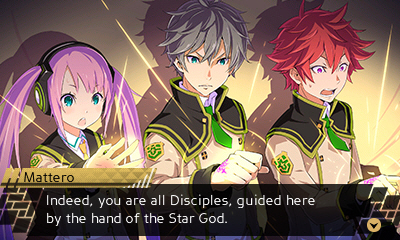 You are “God’s gift,” an S-class student at an Academy which is established to battle demons, protect human civilization, and above all, classmate. In order to progress in battle, you need to pair up with the female students and conceive little creatures which resemble Pokémon but are supposed to be bouncing bubbly babies. The story unfolds mostly through scenes of dialogue. You have the option of picking various locations in your city, engaging with other students, shopping in the town itself, or a variety of other activities. But aside from the act of conception, and classmating with your female counterparts, you’ll want to push through the story and get to the dungeon crawling. When you finally get into combat, you’ll usually go through a “Labyrinth” with a female student. At the onset, she will transform into a scantily-clad babe who is at some point in the animated sequence made basically naked, only to wear an outfit which amplifies her jiggly assets. Along with your babies, you’ll traverse the dangerous location, level up, and collect loot much like you would in any other game like it. Tactical positioning is the key to combat in Conception II. You’ll more often than not have four positions to choose from, and your choice will affect the amount of damage you or your babies will confer on the baddie at hand. This positioning also affects your potential for chain-attacks and other special attacks which are designed to make the combat strategic, fresh, and fun. 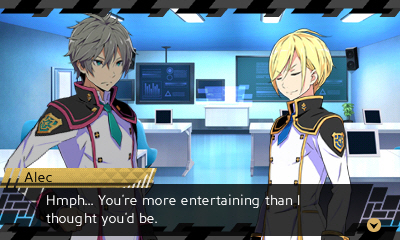 Broadly, Conception II is going to come across as a weird game to American audiences. While many anime–inspired videogames are hard for Americans to swallow, this one is particularly strange given the current marketplace. But this might be why it’s so intriguing and also such a fresh addition to the libraries of both the Vita and the 3DS. The story and combat, in general, aren’t particularly special. It’s really the culture this game promotes that is so original. There’s just something oddly intriguing about a mish-mash of Pokémon, Persona 4, and other role-playing games with the idea of making babies. It’s bizarre but it’s also unlike anything else. You are supposed to develop your children through battle, and to conceive under the “power of love,” an immutable law which guides classmating successfully. With 3 teams of 3 star children, you’re to build an army of babies to traverse these dangerous dungeons and fight together as a family. Its sexualized imagery is going to put off some, but also pull in others. All of the characters are designed to be good looking and also have their own little sub-plots which are supposed to keep you interested. Do they? Sometimes yes, other times no. Generally speaking, the plot isn’t really what drives the game forward. It’s wondering what sort of babies you might make and how certain elements of your relationships, activities, and circumstances might affect that baby’s disposition which keeps you wanting to play. Basically, that’s how you create a Star Child. 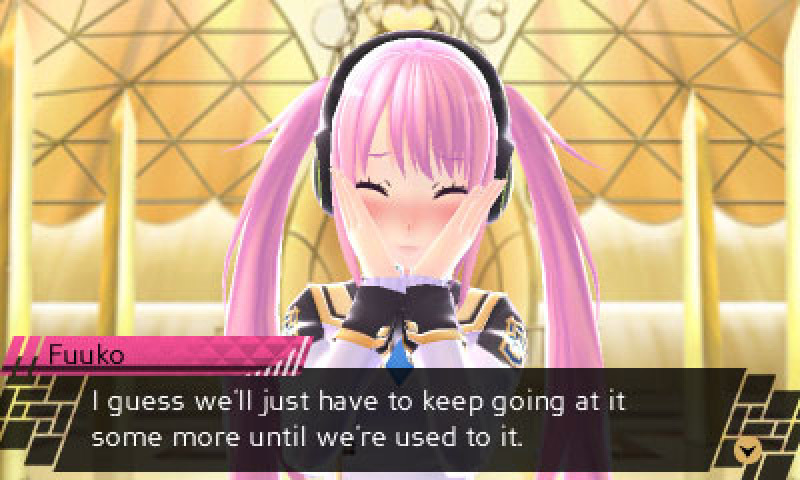 Conception II is actually a pretty long game. It’s about forty to fifty hours and there’s even more to do than the main plotline. There’s a lot going on in the total package. But because of its strange subject matter and the even stranger way in which it gets it across, Conception II is certainly not for everyone. In fact, it might be for such a niche audience that Conception III—if there ever is such a game—may not make it to store shelves. Even with this in mind, it’s a fresh addition the libraries of both current handhelds. There’s really no easy way to explain the content of Conception II. It’s simply unlike anything else out there, but it does bear resemblance to other games. Without worrying or focusing too much on how similar it is to this or that game, it would be recommendable to try it out yourself and see if this is the kind of game you think you could get into. A lot of people love dungeon crawls or role-playing games, and a lot of people love [insert activity] simulators, but there hasn’t yet been a game which is a genuine mating simulator in America. Making babies has never been as fun as it is in Conception II (except, of course, in real life), and it’s also quirky or perhaps silly to have those same babies as your battle-buddies in a dungeon crawl. To be clear, this game might offend people. It sexualizes females almost comically, but it also tries to do the same thing to the males too (though in a lesser degree). Conception II, it seems, rises above the potential mess it might be spreading and offers a unique experience which is simply in a class of its own. If you can get over the immediate aesthetic issues you may or may not have with it, expect to find a fun game which is well worth your time and money. Enjoy classmating and… Please Have my Children!